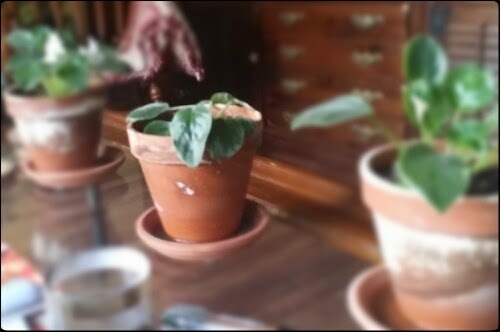 A couple of months ago, these three African violets were one overgrown, root bound, sickly violet in need of some tender loving care. I stopped at Lowe’s for some pots and soil and took the monster violet outside to split it up into three pots. I thought they would look good separated and arranged on our rectangular coffee table in the living room. Two of the violets split well, surviving the trauma of being cut into thirds with ample roots. The middle violet didn’t do as well. When I covered it’s rootless stem with soil in its new pot home, I wasn’t sure it would survive. Sure enough, in the weeks that followed the violet’s stronger brothers thrived and even bloomed, while the middle violet wilted, lost leaves, and looked as if it wasn’t going to make it. I persisted. I watered and fertilized faithfully. I cut away dead leaves. I even spoke encouragingly to it, hoping it would hang on. This morning I noticed that not only are some of the older leaves recovering, but there are also new, bright green leaves sprouting from the center. The weaker violet is going to make it. I had options regarding this weak violet. I could have replaced it. Violets are easy to come by, but I like these white ones because of their simplicity and they aren’t easy to find. I could have made do without it completely, but I’m drawn to arrangements of things in threes. I’m trying to figure out how this applies to life in general. What comes to mind is the familiar phrase, “Time heals all wounds.” I suppose that’s true, although we may not be as open to the way healing winds up presenting itself. Moreover, immersed in a world that teaches us to expect immediate results, we rarely give time the patience required to see recovery through to the end. I’m glad I gave the middle violet a chance to recover the hurt I inflicted upon it. I hope to watch it flourish and bloom for years to come. If it continues to grow, I will feel a sense of accomplishment and joy every time I see it. Beautiful lesson and wonderful wisdom.